Point Shot: The Preds PP is 0-30. What's wrong and how to fix it. - The Point Data-driven hockey storytelling that gets right to the point. Point Shot: The Preds PP is 0-30. What’s wrong and how to fix it. 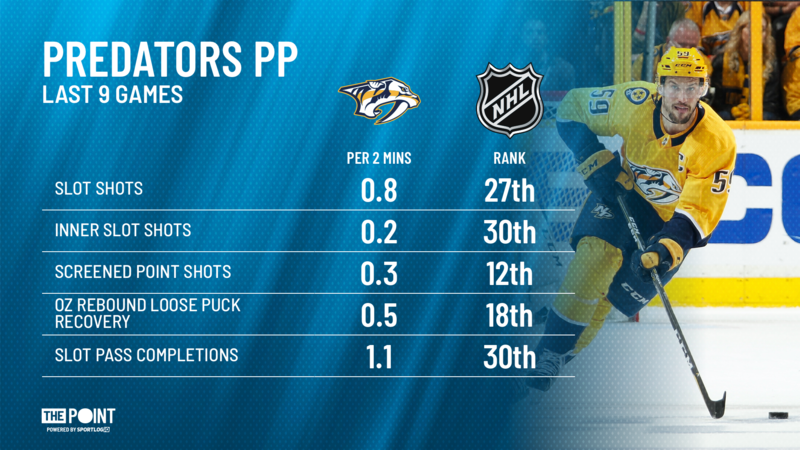 Considered a Stanley Cup favorite, the Nashville Predators haven’t shown many weaknesses in their game. Recently though, their biggest weakness has been on full display. This season the Preds have put together the worst power play in the league, operating at a 12.7% rate. This issue has really reared its head as of late since the Preds haven’t scored a single power play goal in their last nine games, going 0-30 since Filip Forsberg scored against Chicago on January 9th. For the Predators to have true Cup aspirations, they need to get their power play going. They have all the right pieces to have a good power play but they haven’t managed to put it all together yet this season. Part of the problem for them has been a lack of consistent units. Between Ryan Johansen getting suspended for two games and now losing Austin Watson, who’s suspended indefinitely, they’ve had to switch up their units on a regular basis. The results of these suspensions have been that the Preds have used eight different units in nine minutes these last 10 games. A consistent unit lets the players get comfortable with each other so that their set-ups become second nature to them. Another problem they’ve been having is a lack of a net-front presence. They’re clearly emphasizing movement and that’s been pulling their players away from the front, resulting in a lack of traffic whenever P.K. Subban tees it up from the point. Their main plays are all shots from the outside whether that be a one-timer from the point or a shot from the wings. They need to have better traffic in front of the goalie if they expect to have any success there. Not having that net-front guy is making their shots easier to stop and forcing them to miss out on rebound chances. Nashville has some incredible playmakers and even better shooters at its disposal so it has little excuse for not having an above average power play but sometimes players start to overthink it and that forces them into bad plays. For the Preds to start getting better results on the power play, if they are going to stick with this distance shooting mentality, they need to find a guy who’s willing to go stand in front and create havoc for the opposing team’s goalies. It seems like a simple fix but when everything’s going wrong a lot of the time it’s getting back to a simple game that solves the problem for you. 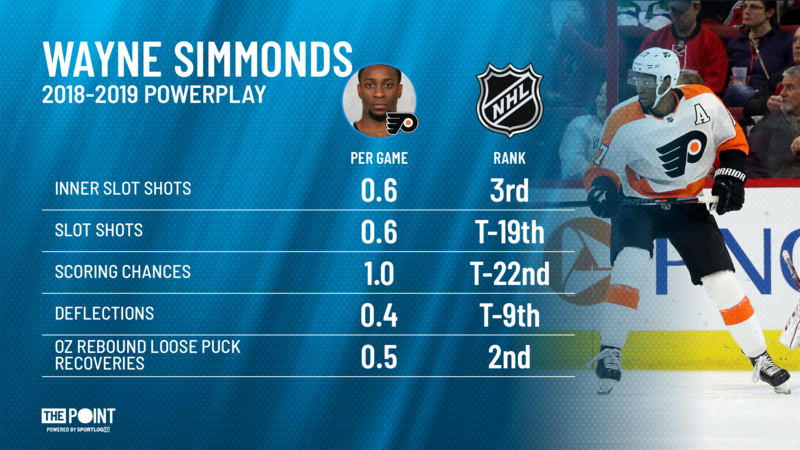 A potential fix to the problem could be named Wayne Simmonds. He’s one of the better net-front players in the league and a guy who would park himself in front giving players like Subban, Forsberg, Johansen, and Josi leeway just let it rip. Adding him to their already deep lineup could be what pushes them over the top.